In Insight 4, more than one 2D Line View can be open at the same time. This allows users to analyse multiple lines simultaneously and compare them side-by-side. 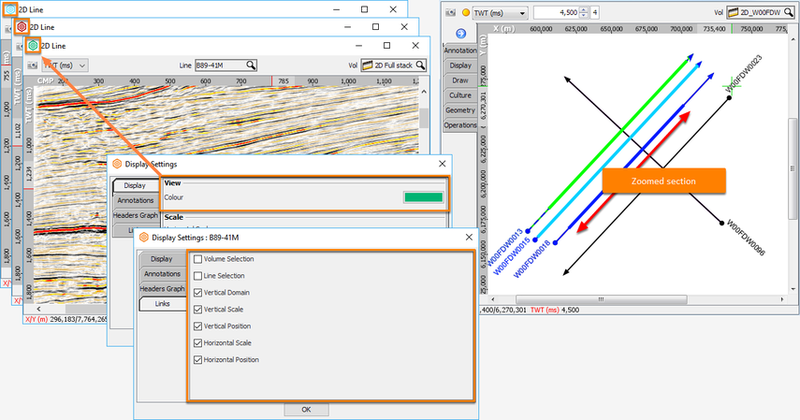 To find out more on how to select multiple lines for viewing in the 3D View, click here Viewing Selected 2D Lines in 3D View. Interested in options for displaying 2D in Map View, see Displaying in Map View (2D Data). From the View menu in the Control Panel. Right click on the line in the Map View and select New 2D View. Select multiple lines in the Details Panel of the volume, right click and select New 2D Views. Select multiple lines in the Details Panel of the survey, right click and select New 2D Views. In an existing 2D Line View, right click and select Duplicate this Window. Tip: Shift click in Map View will update 2D lines that has the link "Line Selection" enabled, see next section. Notice how each view has a unique colour assigned to it. This colour can be changed in the Right Mouse Button > Display Settings > Display tab. The colour of the 2D Line View determines the colour of the line as seen in the Map View. At the Links tab in the Display Settings, select the check boxes to link the line, volume, scale, and position with other views. All views that have the same check boxes selected will have the same line, volume, scale or position (see Linking Multiple Views). Note: By default all 2D line intersections are shown on the 2D Line View. These are turned on/off in the Display Settings (see 2D Line Intersections). Deselect the Show intersecting lines check box to turn them off. The thickness is also controlled there. Line labels can be turned on/off via the Show intersecting line labels option. The zoomed section in the 2D Line View is represented in the Map View by a thicker scroll line. The zoom line can be moved by placing the cursor over the zoomed section and moving it along the line. 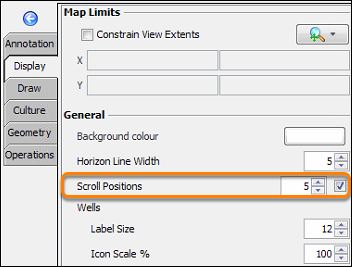 The thickness of the scroll line can be edited, or turned off completely in the Display tab of the Map View.